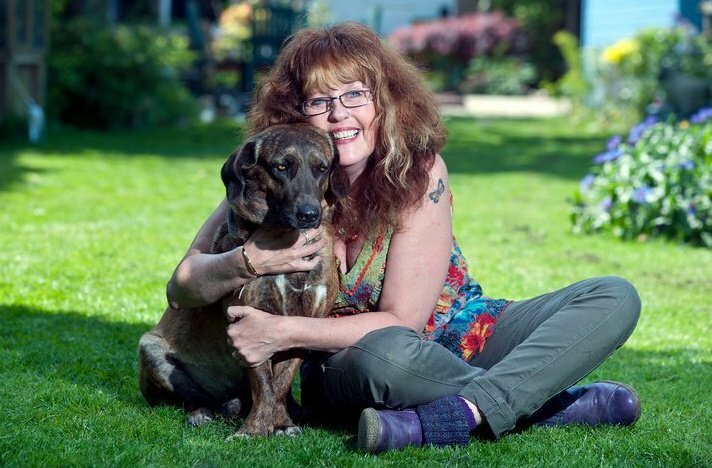 Every year The Dogs Trust hold an Honours ceremony with various categories ranging from ‘Celebrity Pet’ to ‘Hero’ awards. Brin had been nominated for the Hero award along side four others from many thousands entered. This was a complete shock to me but even more so when the publicity started. Calls from The Sun newspaper and various tv stations came flooding in and a date was set for all of them to come to our home on one day..that day being the very next day. The Daybreak programme wanted to interview me at 6.40am and so, setting the alarm at 5.30am, I looked out of the window to see their van already waiting outside with so many satellites plastered all over the roof it was as if they were broadcasting to Mars. Brin, oblivious to his rather busy day ahead, was still asleep in his bed and as he had only been home for around 2 months I still had my concerns to how he would react to so many visitors. Countdown began as I sat at the end of the garden while the presenter walked Brin up the garden talking, live, to the nation about his story. I then began to answer questions about his journey and all went really well until…well here is the video for you to see..
Next came the Sun newspaper who took many pics while I tried to keep Brin under control..
and after that the local radio and tv..
As exciting as all this was there was a sad side to this event. 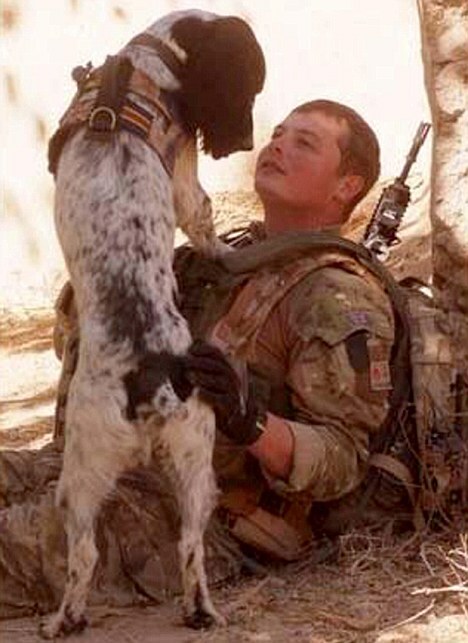 Two months earlier a tragedy had occurred in Afghanistan when L/Cpl Tasker, a dog handler, aged only 26 had died in firefight with the Taliban and soon after his faithful companion Theo, a spaniel who had uncovered countless devises, also died through shock. Theo had also been nominated for the same award and in my mind there was no contest. How could there be? The public voted through a ‘hotline’ set up by The Sun newspaper and I voted for Theo. I had Brin and that was my award. Brin came in a close second and Theo won. The award was presented to his mother and I hope, in some small way, this helped in her terrible loss of something so precious and irreplaceable.